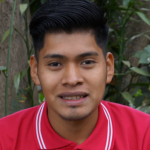 Hector is originally from Palin, Escuintla, and was selected as a GOJoven Guatemala Fellow at the age of 23. He is an expert in automotive mechanics. Hector often participates in small workshops that address sexual education issues with young people in which sexual education issues are addressed. Hector is interested in being part of organizations that works with young people, because he seeks to strengthen their knowledge to contribute in informing Youth of their community. This is the first time he has participated in a training process in Sexual Health and Reproductive Health, and he sees this area of knowledge as a space with a lot of opportunity. He is committed to receiving the necessary training to replicate this knowledge in his community and municipality, because in actuality few people know that sexual rights are human rights as well.